Here is a look at how several former Wolfpack stars performed this week in the National Football League. * David Amerson recorded six tackles in Arizona’s 20-17 win at Green Bay. * Jacoby Brissett was active as Andrew Luck’s backup this week for the Colts in the loss at Jacksonville. * Juston Burris was inactive this week for Cleveland. * Bradley Chubb totaled three tackles, a sack, and a forced fumble in Denver’s 24-10 win over the Bengals. Chubb now has 10 sacks in his rookie season, which is ninth-best in the NFL. * Matthew Dayes didn’t receive a carry this week in San Francisco’s road loss at Seattle. * Mike Glennon was active as Josh Rosen’s backup this week for the Cardinals. * David Grinnage was released by the Jaguars four weeks ago. * Stephen Hauschka hit 1-of-2 field goals in Buffalo’s loss at Miami. * Dontae Johnson continues to work out for teams. * B.J. 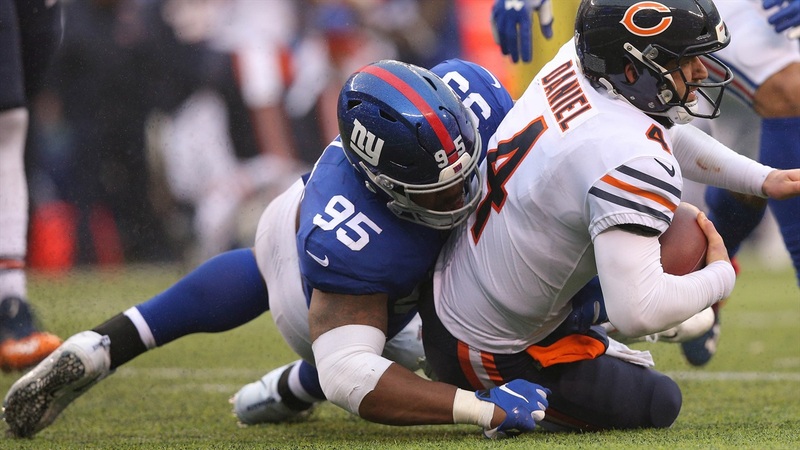 Hill had three sacks and two tackles for a loss in New York’s overtime win over the Bears. Hill now leads the Giants in sacks with five, and no rookie has ever led the Giants in sacks. * Nyheim Hines had nine catches for 50 yards but the Colts were shut out 6-0 at Jacksonville. * Justin Jones didn’t record a tackle in the Chargers’ win over the Steelers. * Josh Jones had five tackles and a sack in Green Bay’s home loss to Arizona. * Ted Larsen started at guard for Miami in the win over the Bills. * T.Y. McGill didn’t record a tackle in the Chargers’ win over the Steelers. * Will Richardson has been placed on injured reserve by Jacksonville. He hasn't played in a game this season. * Philip Rivers completed 26-of-36 passes for 299 yards and two touchdowns with no interceptions in the road win at Pittsburgh. * Jaylen Samuels had three catches for 20 yards and a touchdown in the home loss to the Steelers. * J.R. Sweezy started at right guard this week for Seattle in the victory over the 49ers. * Joe Thuney started at left guard for New England in the victory over the Vikings. * Russell Wilson completed 11-of-17 passes for 185 yards and four touchdowns in the 43-16 win over the 49ers.